Among the record-breaking 9,000 bike commuters celebrating Bike to Work Day in San Mateo County on Thursday, County Supervisor Dave Pine led a convoy from downtown Redwood City to the Oracle energizer station, crossing Highway 101 using the Ralston Avenue bike-pedestrian bridge in Belmont. 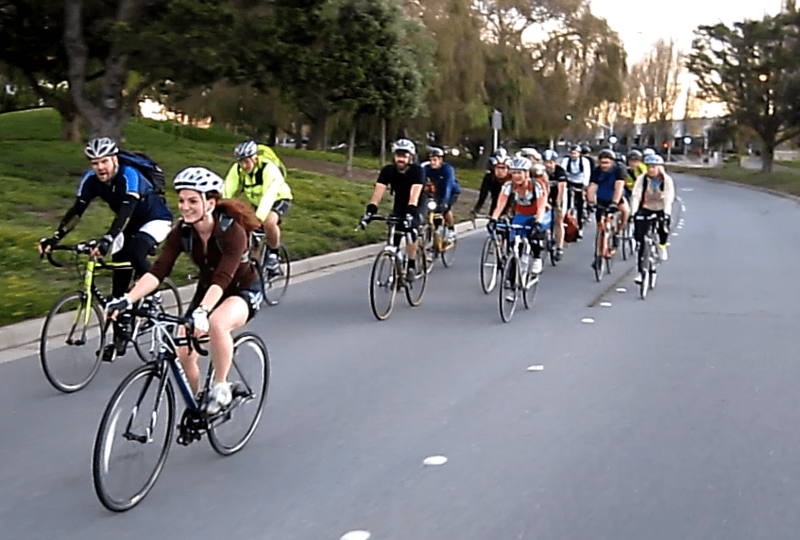 Bike to Work Day is booming throughout San Mateo County, with ridership increasing 33 percent since last year, and more than doubling since 2011, according to the Peninsula Traffic Congestion Relief Alliance. Commuters were greeted with 37 energizer stations along popular bike commuting routes, where volunteers from the PTCRA and the Silicon Valley Bicycle Coalition helped them fuel up with coffee and snacks. Nearly 1,000 cyclists enjoyed an outdoor breakfast at Oracle’s energizer station at the company’s headquarters in Redwood Shores, which lies along the Bay Trail, a route favored by many bike commuters for its long sections of off-street bicycle and pedestrian paths and beautiful views of the San Francisco Bay. Each year, more Silicon Valley employers — from tech giants like Genentech, Facebook, and Google, to other major businesses like Kaiser Permanente (which partnered with Whole Foods) and Food Service Providers — are holding their own events to encourage participation in Bike to Work Day as a way to promote employee health and reduce traffic congestion. While improvements to make bicycling in San Mateo County safer and more convenient have been hampered by a lack of bureaucratic coordination between cities, a few are starting to take the lead. The city of San Mateo is currently planning safer crossings over and under Highway 101: a bike-ped bridge at Hillsdale Boulevard, and a bike-ped path along the 16th Avenue canal under the freeway. The city is also working to install 50 new bike racks throughout its downtown, including four bike corrals, each of which will replace a single car parking spot with eight bike parking spots. At its three local Caltrain stations, the city also plans to install new electronic bike lockers, which, compared to the key-operated lockers they’ll replace, can store five to seven times as many bicycles and be rented by the hour (rather than by the day). Those lockers will “reduce demand for car parking at Caltrain stations and reduce demand for bringing bicycles on-board, freeing up space on the trains for other bike commuters,” said Ken Chin, project manager for the San Mateo Public Works Department. Redwood City, which installed buffered bike lanes on Veterans Boulevard in November 2011, plans to add bike lanes this year to Whipple Road and Maple Sreet, and shared lane markings (“sharrows”) on several other streets that aren’t wide enough to accommodate both parked cars and bike lanes. Longer-term plans include buffered bike lanes on Middlefield Road and a bike-ped path under Highway 101 to connect Main Street with the Bay Trail. 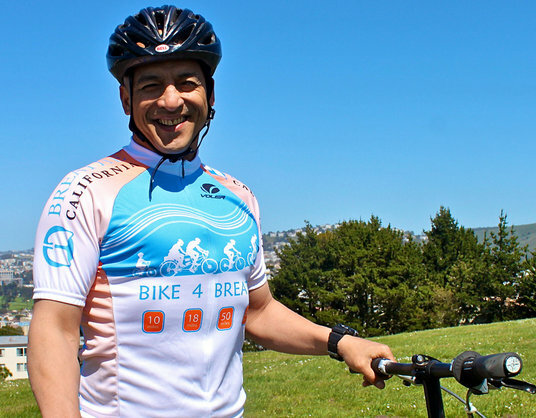 Mike Guingona- Are there plans to add bike lanes on the one section of Bayshore that is under Daly City control? Please carry the Brisbane work on down south. WHO IS that HANDSOME DEVIL in the black jersey with the black beard in the middle of the photo?!?! Great job on this article, Andrew!! 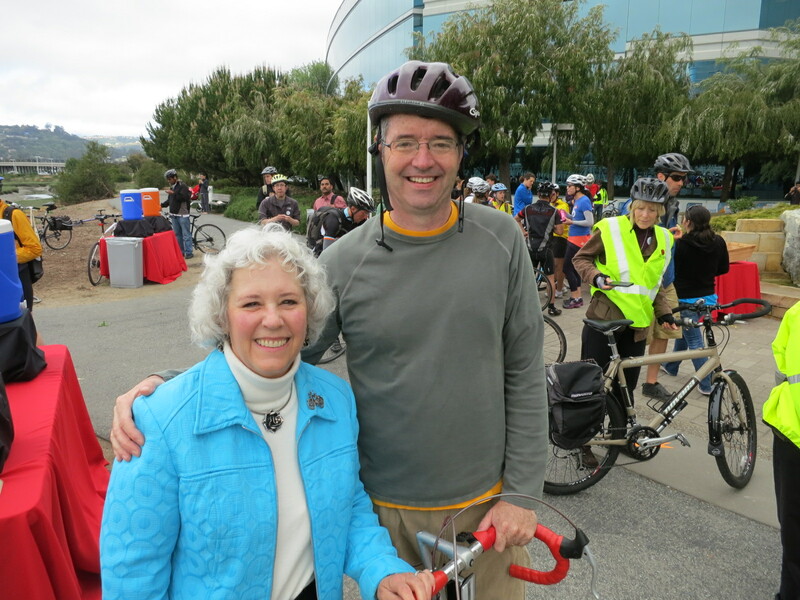 Thanks so much for your commitment to expanding cycling opportunities in San Mateo County. I’m happy to see that Supervisor Pine is riding along with you.